A splendid palladian window, a gabled dormer, and a cozy front porch provide ample curb appeal for this lovely home. 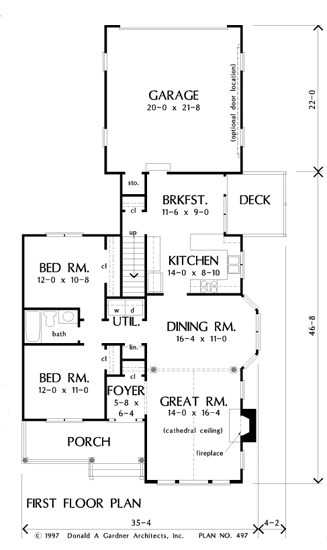 Well-suited for narrow lots, this plan features a rear entry garage and all-over slim design. The vaulted great room is highlighted by an impressive palladian window and is separated from the dining room with bay by two interior columns. The U-shaped kitchen is adjacent to the breakfast room with side deck access. 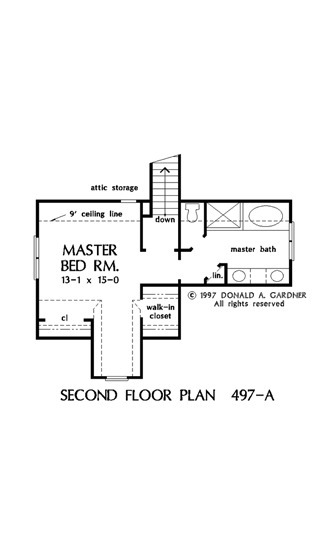 Two bedrooms on the first floor share a full bath, while upstairs, the master suite features a dormer, his and her closets, and a private bath. 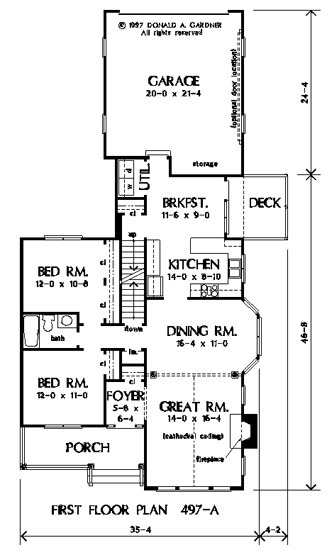 1st Floor: 1222 Sq. Ft.
House Dimensions: 35' 4" x 68' 8"
Great Room: 14' 0" x 16' 4"
Master Bedroom: 13' 1" x 15' 0"
Foyer : 5' 8" x 6' 4" x 8' 0"
Dining Room : 16' 4" x 11' 0" x 8' 0"
Great Room (Cathedral): 14' 0" x 16' 4" x 15' 0"
Kitchen : 14' 0" x 8' 10" x 8' 0"
Breakfast Room : 11' 6" x 9' 0" x 8' 0"
Utility Room : 5' 8" x 3' 0" x 8' 0"
Garage : 20' 0" x 21' 8" x 0' 0"
Garage Storage : 3' 4" x 3' 0" x 0' 0"
Master Bedroom (Vaulted): 13' 1" x 15' 0" x 9' 0"
Bedroom #3 : 12' 0" x 10' 8" x 8' 0"
Porch - Front : 18' 4" x 6' 4" x 0' 0"
Deck / Patio : 9' 0" x 9' 8" x 0' 0"